Newman-Dailey Resort Properties, which specializes in Destin vacation rentals, provides free movie rentals and more to families staying in a rental house or condo along Florida’s Emerald Coast for the holidays. Approximately one third of holiday travelers stay in a vacation rental for the December holidays. Families seeking a place to gather for the holidays are discovering a Florida vacation rental may be the perfect solution. The HomeAway Holiday Travel Report revealed that approximately one third of holiday travelers (31%) stay in a vacation rental for the December holidays. Families often want roomier accommodations, as well as access to a kitchen, pool/hot tub and laundry facilities, which vacation rentals provide. They also want a scenic, relaxing destination that offers something for the entire family. Therefore, Newman-Dailey Resort Properties, which specializes in Destin vacation rentals, is inviting families to discover the joy of staying in a Destin rental house or condo along Florida's Emerald Coast for the holidays. Newman-Dailey also offers families added benefits, including free movie rentals and tickets to area activities. "Families who stay with Newman-Dailey tell us they enjoy Destin’s relaxed coastal setting along with the comfort and convenience of staying in a Destin vacation rental for the holidays," said Jeanne Dailey, CEO and founder of Newman-Dailey Resort Properties. 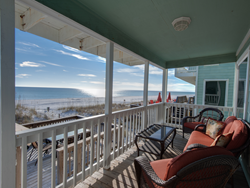 From well-appointed rental homes and comfortable beach-front Destin condos to cozy townhomes and villas, Newman-Dailey's vast array of beach vacation rentals sleep groups from six to 16. Each vacation rental is equipped with a full kitchen, and most have a washer and dryer, providing the conveniences of home amidst a beautiful beachside setting. Families gather within the kitchen to prepare their favorite holiday recipes or take advantage of the special holiday menus available at Destin restaurants. Some families combine the best of both worlds by enjoying ready-made holiday meals from Honey Baked Ham or Wendy's Kitchen within their comfortable vacation rental. Among the many benefits of staying in a Newman-Dailey vacation rental is the Newman-Dailey Gift Card, good toward free movie rentals and tickets to area activities. Whether choosing a Seablaster dolphin cruise or enjoying the complimentary tickets to The Track, families will cherish the special memories created along Florida’s Emerald Coast. Guests of Newman-Dailey also enjoy special offers and partner discounts, including 20 percent off two of more dinner cruise tickets aboard the SOLARIS. Newman-Dailey features a diverse array of premier South Walton and Destin vacation rentals, including rentals at Sanctuary at Redfish, Hidden Dunes Beach & Tennis Resort, and Jade East Towers in Destin. To learn more or view the full breadth of rental options, visit DestinVacation.com or call 1-800-225-7652. Newman-Dailey Resort Properties is a premier vacation rental, real estate sales and association management company located in Miramar Beach, Fla. Founded in 1985, Newman-Dailey is celebrating 30 years of welcoming guests to the beaches of South Walton and Destin, Fla. Recognized for excellence, integrity and professionalism, Newman-Dailey consistently receives the "Certificate of Excellence" for positive reviews on TripAdvisor and earned the BBB’s 2015 Torch Award for Marketplace Ethics. The Real Estate Division is consistently listed among the top 10 percent of real estate companies along the Emerald Coast for sales. For more sales or rental information, call 850.837.1071, or visit online at DestinSales.com or DestinVacation.com.